Fell in love with New York. Learnt how to make pie pastry and bake bread. Felt very loved on my hen do. Sat on a swing and watched the sun go down in Copenhagen. Meted out justice on jury duty. Watched my very first baseball game and my very first cricket game. Voted in my second ever general election. Listened to 'Yes Please' on audiobook a million times. Celebrated the engagements and new babies of our wonderful friends. Knitted baby blankets for all the new arrivals. Watched the stars at Kielder. Starred on The High Tea Cast Podcast. Watched the changing of the seasons and revelled in the sunshine. Drove in my gorgeous new Mini. I'll never have such a fancy car again. Took a trip back to my alma mater. Lost myself in bookstores and in the books themselves. Despaired whilst searching Rightmove for our potential future home. Bought my first ever designer handbag. Cried during my wedding speech. Collected a whole lot of cookbooks. Danced like a loon with my family at my Dad's wedding. Ate everything at Leeds Indie Food Festival and being so proud of this city. Welcomed my sister into our home for a year. Gave a standing ovation at The Curious Incident of the Dog in the Night Time. Drank cocktails in a secret garden with some of my favourite people. Ate a pig's trotter (and a whole heap of other stuff). Reminded myself that the best is truly yet to come. 1. I have enough time for reading. If you haven't heard me go on about it, then it may surprise you to know that I've read 96 books so far this year. Which is a whole lot of books. I have always been a big reader, but fell out of the habit during the later years of school and University, proclaiming that I didn't have enough time to read. Well, it turns out I very much do, and I'm going to take advantage of that fact for as long as possible. 2. Driving isn't as scary as I thought. I am definitely not going to tell you that I am a good driver. I am an average driver, but I like to think that my caution makes me quite safe. I was terrified of driving for years, despite having passed my test, but picked it back up again this year and got myself a pretty swish car, which made it so much less scary than it once was. I'm still learning and still getting past that anxiety, but I know now that it will pass, so I don't have to commit myself to a lifetime of being terrified of the road. 3. Being married is pretty cool (and it is different from not being married). This is obviously something that I could never have known before, but having got married this year I can affirm that it is pretty cool. And, despite what I say to people about married life being pretty much the same as unmarried life, I do feel like the commitment that I have made has changed my relationship for the better. We have always been a team, but now we've agreed to be a team for life, which changes the decisions we make and the discussions we have. The everyday is still very similar, but it's neat to know that Paul wants to be with me forever. 4. Travel isn't a transformative experience for me. I am not well-travelled and it doesn't bother me, which I think is pretty much the closest thing you can get to a sin in 2015. I understand why it's so high on some people's priority lists, and I do enjoy seeing new places (and eating new foods!) but it isn't a transformative experience for me. I am an anxious traveller at best, and as much as I would like my holidays to make me into a better, more understanding person, I think I'm better off picking up a book or doing some volunteering at home if I want to improve my life. Maybe this will change in the future, but I'm happy for now to put travelling slightly down the list. 5. I'm quite good at my job. I'm getting into the three year mark in digital marketing now, and I like to think that I am getting good at it. There's always room for improvement, of course, and some people spend their whole lives getting good at their careers so I know there's a long way to go, but for now I'm happy that I know what I'm talking about and can do my job to a good standard. This is the first time I've been in any way established in a job or career, and it feels good. 6. New York is as great as everyone says. I've always been a bit sceptical of people who rave about New York, like they were trying to join some cool club. I take back all of my judgement, because after visiting New York for the first time as an adult, I am totally signed up. New York is a magical city, and it will steal your heart just like everyone always says it will. I think I could go every year for the rest of my life and never be bored of it. If there's a cool club of New York-loving people, then sign me up! 7. My grandparents are the best people to hang out with. It sounds morbid, but this year is the first year that I really realised that my grandparents aren't going to be around forever. I have a relatively young family, so it's only now that my grandparents are starting to hit old age, and experience all the related mess that it brings. I've been very lucky in that, and also in the fact that my grandparents are the most generous, wise, wonderful people I know. I'm making it a priority to spend more time with them, because they're all fantastic people and super fun. 8. Good skincare is worth the money. This is the year that I invested in good skincare and began to worship at the altar of Caroline Hirons. I've spent a small fortune, but I've finally got a skincare routine that works for the skin I have now (rather than the skin I had when I was a teenager). It's been worth every penny and my skin has never looked better. I'm starting to notice the start of wrinkles so I'm glad this is a lesson I'm learning now! I'm closing in on my target of reading 100 books in 2015, with only a few days left to go. I'm pretty sure I'll be able to finish in time and, looking back, I can't believe how many books I managed to get through in just one short year. I feel like I've learnt a lot from taking on this challenge, not least that I really can find time for reading if I prioritise it. I've fallen for reading all over again, and I've discovered new authors and a book-ish community online, and it's just been wonderful. My 'to read' list was around 200 books at the start of the year and, although I've read almost 100, the list has grown to over 400 in that time. Reading more makes me want to read more - there are so many fantastic books out there to get my hands on and I'm discovering more all the time. That said, not every book I've read this year has been a stand out. There have only been a few duds, books I wish I hadn't picked up but finished for the sake of this challenge, and only one that I put down and never picked back up again. There have been lots of enjoyable books, but many of them don't stick in my mind longer than a week, and are unlikely to become permanent favourites. However, these ten books have stayed with me throughout the year for one reason or another, and I've been recommending them to as many people as possible. Some are just incredible reads; the kind you want to tear through in a day and simultaneously wanting to get to the end, whilst never wanting to get there because it will all be over. Some are thought-provoking and life-changing. A couple are a mixture of both. Addy and Beth are the queens of the school, and of the cheerleading squad. But when a new coach begins to favour Addy over Beth, who has always been top of the stack, the cracks in their friendship begin to show. This book set me on a bit of a Megan Abbott binge and, although her other books are enjoyable, this one is addictive. It's fast-paced, slick and tense. It captures something unique about teenage girlhood, friendship and ambition, and you'll devour it in a day. This is Amy Poehler's memoir and it has changed my life. I'm not exaggerating about that (for once). Not only is this a gentle, funny look at Amy Poehler's life, it's also full of wisdom about being a woman in the world. I bought the audiobook, too, and listen to it whenever I feel sad. Amy Poehler has such a wonderful way of looking at things, and I hope one day to be able to be so generous of heart and spirit. I was initially dismissive of Rainbow Rowell's work, which seemed too romantic, too schmaltzy for my tastes (based on the cover I should add - a lesson for all of us). I was so, so wrong. Her books are heart-warming, smart, funny and an all round delight. Fan Girl follows fan fiction author and new college student Cath as she navigates the new world she finds herself in on her own, without her sister Wren. Prepare to laugh, cry and nod your head in recognition. This book is so hard-hitting, it will stay with you for a long time. It was one of the first books I read in the year, and I'm still recommending it to people all the time. Set in a dystopian universe where women are bred to be wives and concubines and trained in the art of pleasing men, competition is fierce between girls for the most covetable 'wife' spot. It's uncomfortable and a little too close to home, despite the dystopian setting, but so, so good. I went into this book blind, and it absolutely blew me away. The book tells the story of Rosemary and her family, including her unusual sister Fern, who disappeared when Rosemary was young, and her estranged brother, Lowell, who is wanted by the FBI. As the tale unfolds, this book will make you question some of your most deeply held beliefs about family and humanity. Truly unusual and astonishing. Sofia Khan is a Muslim woman living in London and trying to navigate dating, her family, her friends and her religion. It's a Bridget Jones-style take on modern dating life from a character that you can't help but love for her forthrightness and her kind heart. For non-Muslim readers it feels familiar and unique all at once, and is truly a charming read. Ta-Nehisi Coates tells his life story, focusing on what it really means to have a black body in the USA. It's incredibly moving and so thought-provoking; I've had numerous conversations about its contents since reading it on holiday in October. With race relations in the USA being what they are, this is a really important book. Don't read this book if you don't want to be completely emotionally wrung out by the end, because there's no way to survive this book intact. Dan tells the true story of his chaotic family life, as they struggle to care for his terminally ill father, who was once the head of the household and the centre of their family, and their mother, who is battling cancer. It's frustrating, it's surprisingly funny, it's dark, it's emotional. It's brilliant. Christmas is a time for indulgence, but also for relaxation. This pudding really combines the best of both, taking just minutes to prepare, but being made up of all the very best things - booze, ice cream, coffee and sugar. If you're looking for a low maintenance dessert to serve to guests over the Christmas period, this is a great option. 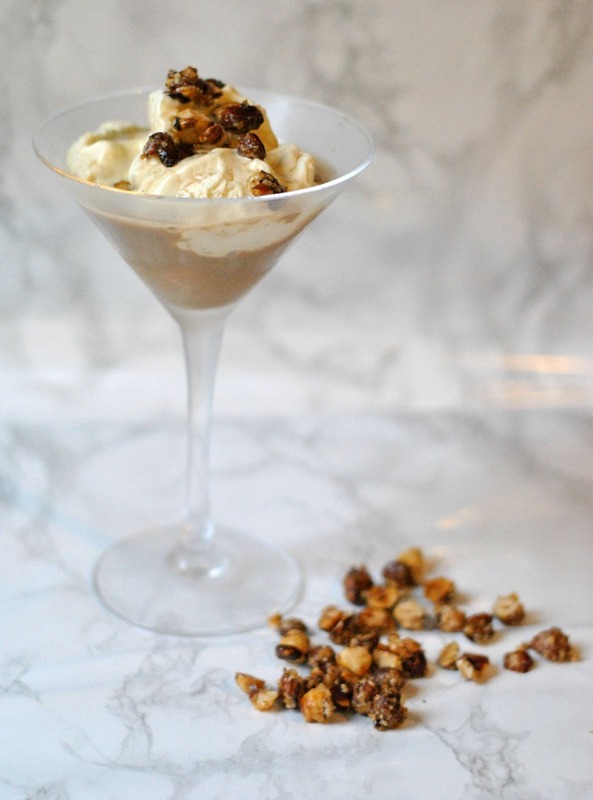 The combination of the hot, boozy coffee and the cold ice cream is quite delightful, but it's taken to another level with the crunchy, sweet hazelnuts. You can prepare the hazelnuts a day or two before and, once cool, store in a sealed container until you're ready to serve up, which will save you some time if you're eager to get back to the table for some cracking anecdotes and cheesy cracker jokes. 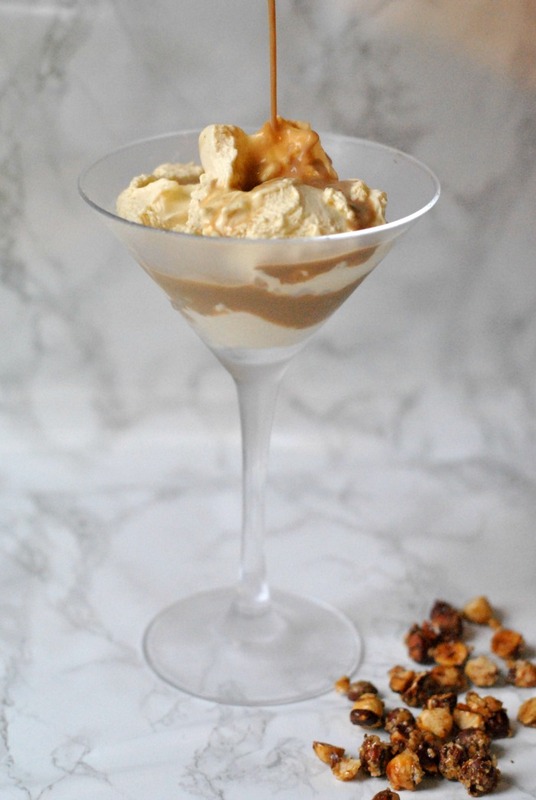 As with so many of the best desserts, this one is infinitely customisable - swap the Irish Cream for your favourite liqueur, or mix up the ice cream flavours (salted caramel would be to die for, no doubt) or even try some candied almonds or pecans. Kids can be served a decaf, non-boozy version, or just given some ice cream and chocolate sauce. This pudding really is the gift that keeps on giving. Heat the hazelnut pieces in a heavy non-stick pan over a medium heat for a minute until warmed through. Stir in the sugar and turn down the heat slightly to prevent burning. Continue to stir and cook until the sugar melts and coats the hazelnuts. Remove from the heat and spread the hazelnut pieces onto a piece of greaseproof paper. Leave to cool. Store in a sealed container for up to 2 days. Place your serving glasses into the freezer well ahead of time. They need to be very cold to stop the ice cream melting as soon as the coffee is poured on top. Mix together your espresso and Irish Cream in a small saucepan and heat over a medium heat until warmed through, but not boiling. Meanwhile, remove the glasses from the freezer and serve a scoop of vanilla ice cream into each glass. Pour over a quarter of the coffee mixture into each glass. Divide the hazelnuts and scatter over the top of the dessert. Serve immediately! You can use any kind of glass to serve the Affogato - I used martini glasses, but you can use wine glasses, tumblers or glass mugs. You could also use bowls, in a pinch. This year has definitely been about refinement rather than invention for me in the kitchen. I think 2015 has been my busiest year yet, and blogging recipes - which definitely take the most time to get sorted - has kind of taken a back seat. I want to turn that around next year and I have big plans for this space. That said, I still blogged a lot of recipes that I'm proud of, and that I'm still making regularly in my kitchen. The stuff that I make for this blog really is the stuff that I eat every day (or, in the case of baking, foist upon my willing friends and colleagues for the sake of my health), so I hope that you find something here that you enjoy and can make a part of your kitchen life. Here's to more deliciousness in 2016! What have you been cooking in 2015? Is there anything more quintessentially autumnal than caramel apples? 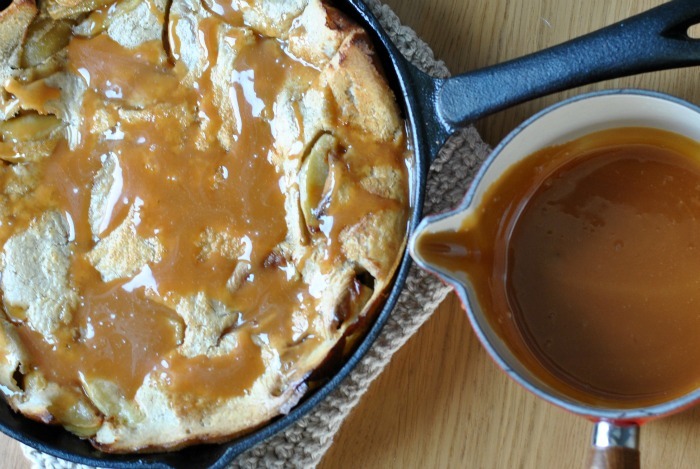 With Bonfire Night on the horizon, I felt that it was time to submit to my desire to eat all the caramel apple flavoured things, so I baked a caramel apple pie and rustled up this Dutch Baby for a Saturday morning breakfast. This is the best kind of breakfast - the kind that takes a little bit of preparation but not a lot of effort, and which really tastes best with ice cream. 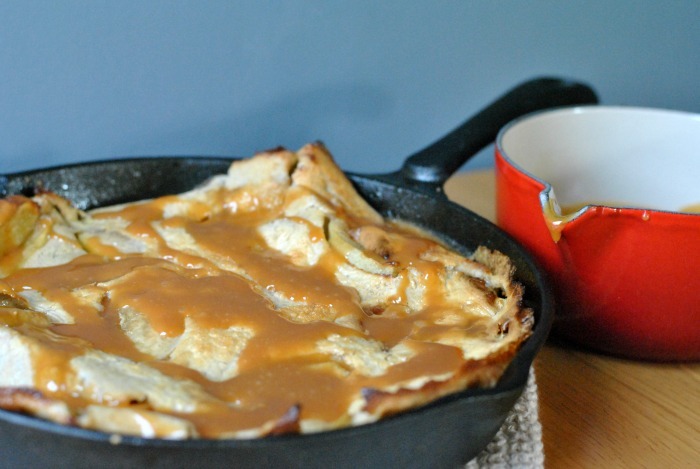 I aim for an 80/20 split of healthy/non-healthy food in my life, but when Caramel Apple Dutch Babies are involved, I'm willing to relax the rules a little (a lot). Cooking this up in the morning will make your kitchen smell delicious, and will tempt out any sleeping friends or relatives in the vicinity to join you at the breakfast table (or breakfast sofa, no judgement here). Serve with hot coffee, fresh juice and the aforementioned vanilla ice cream to get all those good autumn feelings. Then pull on your wellies and go and kick some crunchy leaves whilst you still can. Winter is coming, people. Make the most of autumn for now. Melt the butter in a skillet before adding the apples and sugar. Leave over a medium heat, stirring occasionally for around 5-7 minutes until the apple slices have softened and are fully coated. Meanwhile, whisk together the eggs and milk until combined, before adding the flour and cinnamon. If possible, use an electric mixer to whisk together - the more air you have in the batter, the better! Make sure the apples are in one layer (or thereabouts) on the bottom of the skillet and pour the batter on top. Quickly transfer to the oven. Bake for 18-20 minutes until your Dutch baby is all puffed up and golden brown! 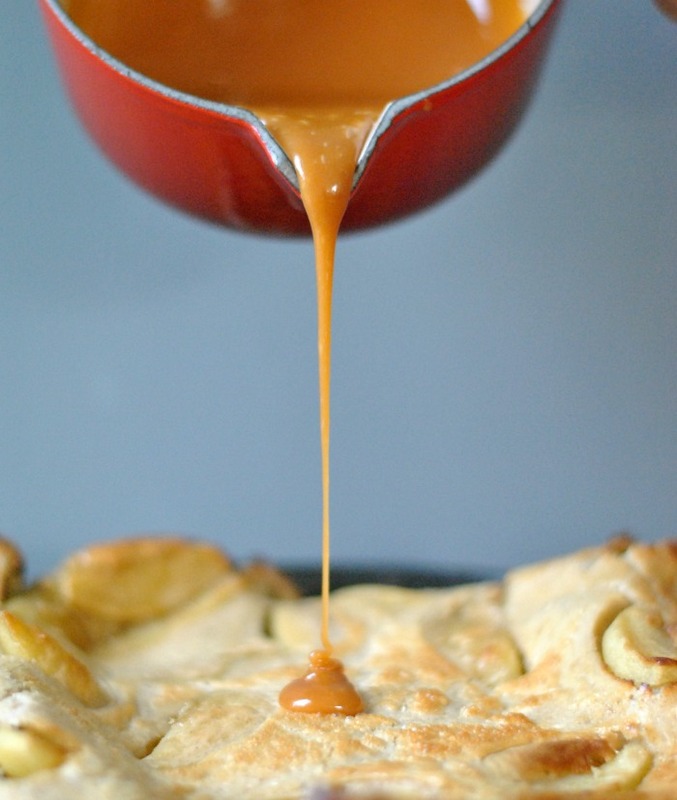 Serve immediately with caramel sauce. Mix together the sugar and water in a saucepan. Place on a medium-high heat and heat until the sugar has dissolved. Turn up the heat and boil for 4-5 minutes until the mixture has turned a deep caramel colour. Do not stir! Remove from the heat and add the butter and cream. Stir together until smooth and leave to cool. If you don't have a non-stick skillet available, you can cook the apples in a frying pan and transfer to a pre-heated oven-proof dish before adding the batter. I think we can all agree that chocolate is one of the best things about being a human. It's sweet, creamy, delicious, and it fights off Dementors. Or something. Either way, it's a total winner and I, for one, cannot get enough. Dark, milk, white, it doesn't really matter; I will happily eat a block of chocolate all to myself. However, in an effort to be a little healthier in my old(er) age, I have been choosing quality over quantity. It's not quite as fun as gorging on a bar of Galaxy whilst watching Bridget Jones' Diary, or some other such cliché, but it has its perks. Like these truffles. Just three ingredients and a little bit of love, and you have yourself some more-ish, decadent truffles. They're very rich, which means that even the likes of me and my chocolate addiction can only manage a couple at a time. So it's really a win-win. Mouthfuls of rum-my, chocolate-y goodness and you can still say you've made a healthy choice. Or thereabouts. When it comes to my health, I'm aiming for better, not best. I will never be the girl that turns down chocolate, especially when it tastes as good as these. How many of us make an effort in the kitchen when there's someone else involved, a loved one, a guest, a friend, but not when we are alone? I hear confessions of oven chips and ready meals, because it's too much hassle just for one, far too often. If that is you, I hope that this dish will change things for you. This dish is a love letter to yourself, best enjoyed alone with a glass of wine and your own thoughts. It is simple and quick enough that cooking for one seems like no effort at all, but it requires your full attention. Parsley needs to be methodically chopped until fine. Spaghetti needs to be tested, to be sure it's al dente. Pans need to be watched in case the oil overheats and the garlic becomes bitter. You can customise it to your exact specifications, just the way you like it. You're cooking for yourself, after all. Whether it's a grating of Parmesan, a little lemon zest or a handful of prawns, make it your favourite way. You deserve this dish. If you don't love and nourish yourself, then who will? Bring a pan of salted water to the boil and cook the spaghetti until al dente. Meanwhile, finely chop the garlic and parsley. Add to a frying pan with the chilli flakes and oil. Heat gently until the garlic has just started to turn a light golden colour. Keep an eye on it, if you overcook then the garlic will turn bitter. Lightly drain the spaghetti so there's still some water in the pan. Add to the warm oil and stir together. Serve with a glass of wine and a grating of parmesan, if you fancy it. Despite my best efforts, I am still guilty of skipping breakfast more often than not. Maybe it's because I can't get into avocados, which seem to be the breakfast of choice for the thinking woman these days. It's the texture. It's just too weird for me. I think mostly, however, that it's a lack of time and inclination in the morning. A bowl of cereal, whilst fast, is hardly inspiring and is so easily forsaken for a few extra minutes in bed or a cuddle with the cat (or, chasing her around to try and give her a hug...). Coarsely grate the potato and courgette using a box grater. Place in the centre of a tea towel and squeeze over the sink to get rid of a lot of the moisture. 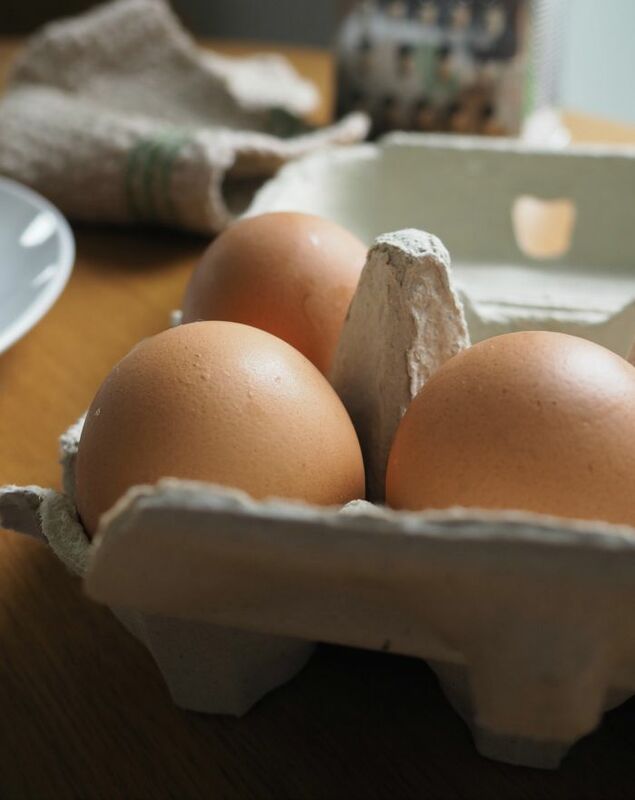 Transfer to a bowl and mix with the beaten eggs and flour. Season liberally with salt & pepper, and throw in a pinch of crushed chilli flakes. Heat a small amount of oil in a large frying pan until it begins to bubble. Spoon a quarter of the potato mixture into the frying pan and flatten into a disc. 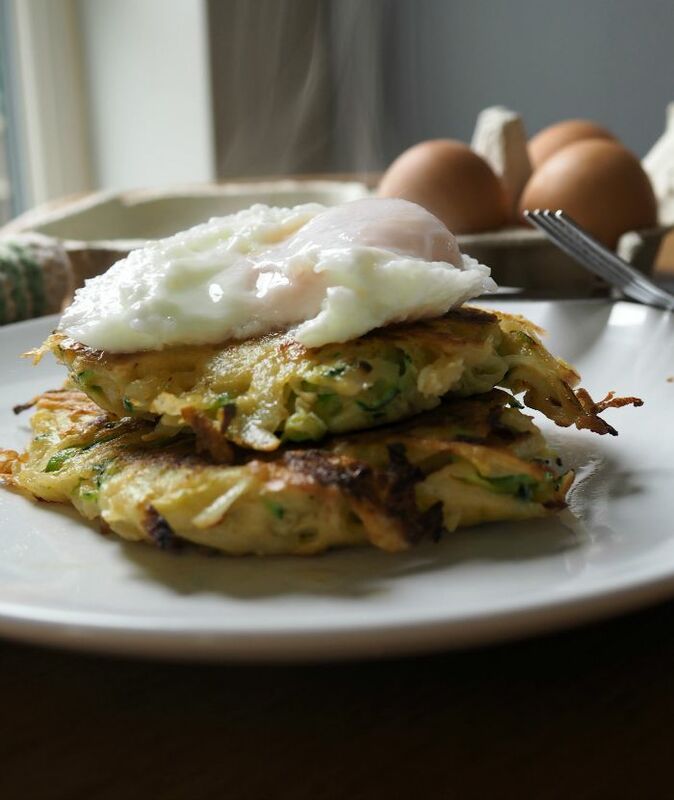 Repeat until you have four rostis in the pan. Cook for 3-4 minutes before flipping over and repeating on the other side. 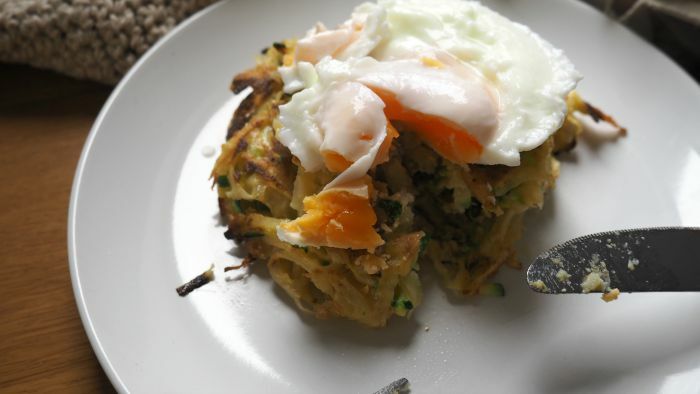 The rostis should be lightly browned and crispy on the outside. Serve immediately with a fried or poached egg on top. Sometimes simple is best, and I never crave simplicity in food as much as I do in summer. When the sun is shining and you're itching to get outside and pour yourself a glass of Pimms, it's best to stick to the simple things - which is easy to do, because summer produce is so delicious. Don't get me wrong, I love a hearty winter stew as much as the next girl, but the reams of fresh produce to choose from in summer is so much more inspiring than the paltry winter vegetables that grow in the colder months. I get a bit giddy in the greengrocers, piling my basket high with berries, peaches, radishes, asparagus, courgettes, rhubarb and spring greens. The options seem endless, but the most important thing is keeping things simple and letting the flavours come through. 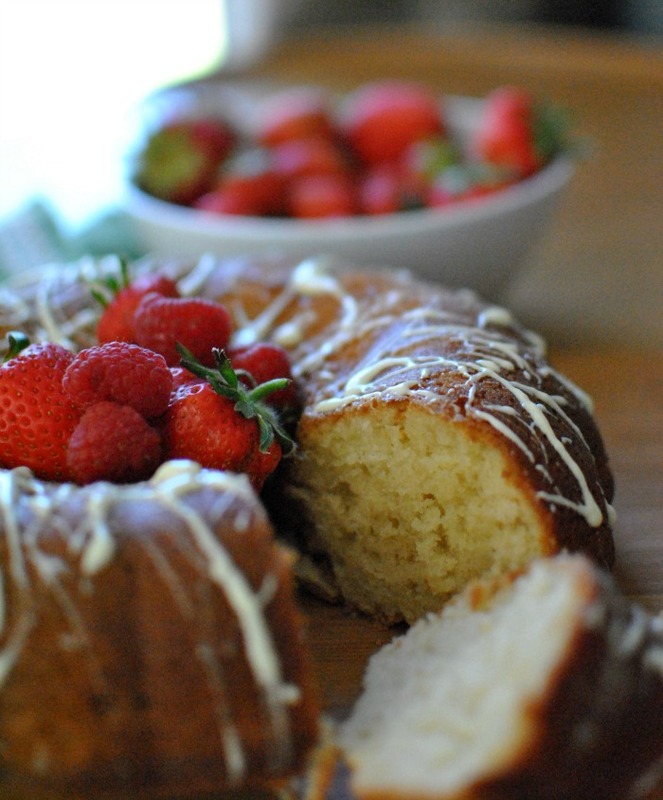 Which makes this the perfect cake to enjoy in the summer. Baking is not a particularly summery activity; it fills your kitchen with unnecessary heat and keeps you inside. But this cake is as quick and easy as they come, so if you are craving something sweet then this is the one for you. The cream cheese makes the sponge moist, the crumb is just beautiful, and the vanilla is a perfect partner to all of that summer fruit. The bundt cake shape makes it seem that bit more excited than your standard loaf or layer cake, but without any extra effort. It really is a win-win sort of situation. I served my cake with a drizzle of white chocolate on top and some fresh strawberries & raspberries. It's a classic combination, and one that doesn't need thinking about, but this cake will go with any summer fruit, really. Perhaps a bit of cream or ice cream on the side. Or maybe a dusting of icing sugar. There's no pressure. We're keeping this simple. Grease a bundt cake tin well and set to one side. Pre-heat the oven to 160C. Using an electric mixer set to a low-medium speed, mix the cream cheese until soft. Add in the butter and sugar and beat for another 3 minutes until well-combined and fluffy. Pour in the vanilla and stir until incorporated. Add the eggs one at a time, mixing for a minute or so each time. Turn the mixer down to low and add in the flour mixture. Mix until just incorporated and then turn off the mixer. Stir gently by hand to finish the job. Pour batter into the bundt cake tin and place in the oven. Cook for 50 minutes - 1 hour until a skewer or knife inserted into the cake comes out clean. Check about halfway through that it's cooking evenly, and rotate if necessary (the front part of my oven always cooks things quicker!). Leave to cool for 15 minutes or so after removing from the oven, before turning out onto a wire rack to cool. Serve with fresh summer fruit and, preferably, a glass of Pimms!